When searching your LinkedIn feed looking for that professional who posted about — fill in the blank: infographic, workshop or offer — you realize social media is the modern day “yellow pages” of professional introductions. You must be there and with valuable content. But, who has time to come up with worthy content and share it on LinkedIn? Anyone who is serious about maintaining a digital profile knows that visibility with contacts is critical to turning suspects into prospects into clients. Okay – so the reward of social media sharing is well documented. Now, what will you post? Link to your website. For example, articles, investment commentaries and perspectives. Look for infographics. They’re popular because they are visual. Create an invitation. Offer to share your latest take on the market over coffee in your office. Find published articles. Use the media to reinforce the beliefs and practices you preach to your clients. For those looking to really differentiate themselves, consider including personal branded content on your LinkedIn “activity space.” Showcase articles about health, fitness or medical breakthroughs; food and wine; travel; regional articles, etc. Sharing non-financial, personal interests can open doors to other like-minded individuals while remaining true to your authentic self. Finally, post as often as you can support relevant content. Some professionals post every day, others post two to three times a week. Key to your social sharing is to be present and consistent. If you shoot for twice a week, commit to maintaining this drip of content for the long term. LederMark is rolling out a new social media subscription service for financial advisors. Our goal is to provide you with a monthly mix of relevant, social posts ready for review with your compliance department and ready for sharing with your clients and prospects. 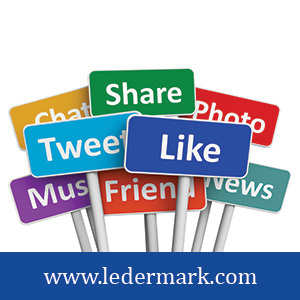 For more information, email me at leder@ledermark.com. Gerri Leder is president of LederMark Communications, a communications firm engaged in branding, practice management, thought leadership and communications. She is a certified professional coach.